Hi, Davao Traveler! Have been to the Shrine Hills? You should! At Shrine Hills you get a chance to see a panoramic view of downtown Davao, the Davao Gulf, the Samal Island, and the magnificent Mount Apo. It is also the home of many TV and Radio Broadcasting Studios like ABS-CBN, GMA Networks, ABC 5, etc. The popular Jack’s Ridge Restaurant is located in Shrine Hills. If you wanna play gulf on top of the hills, there is Andrew’s Golf. And if the sound of the name makes you think of something holy, in many ways it is. 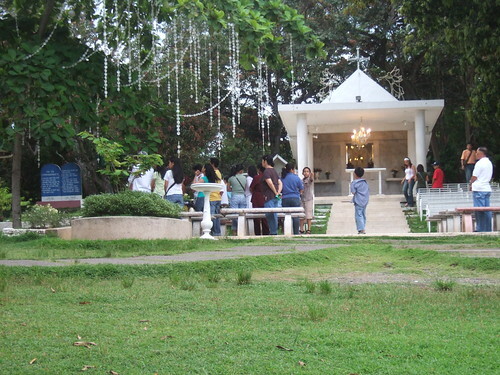 The Shrine Hills is known for grounding the site of Shrine of the Holy Infant Jesus of Prague — a church, seminary and meditation center for the devout Catholic Christians in Davao. People go there for various reasons: to pray, to play with the kids, or to unwind with the whole family. You should try to go there especially on Sundays. You will see how fun and loving the Filipino family can be at the Shrine Hills.